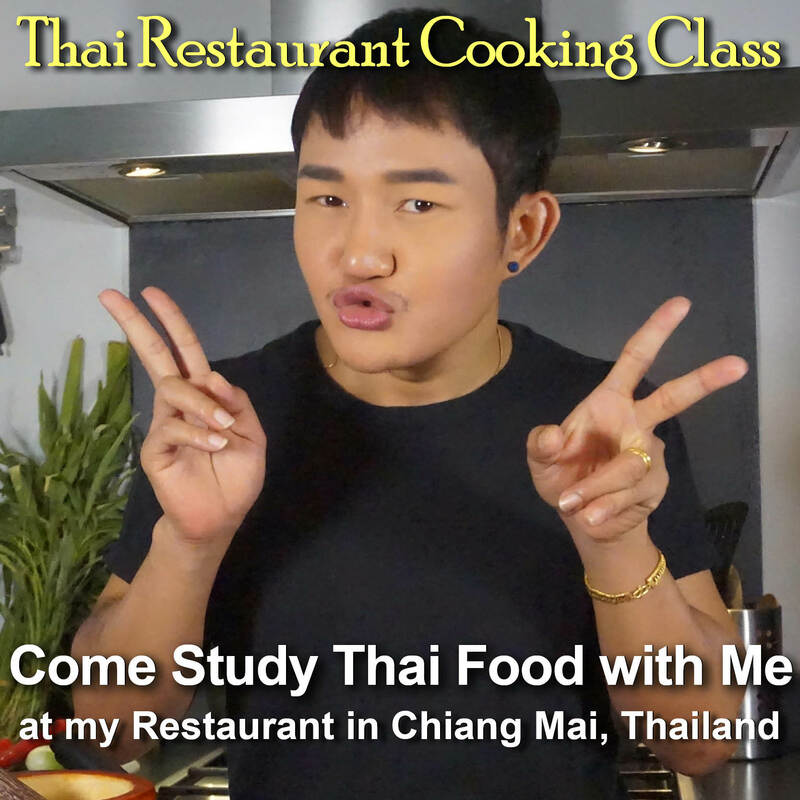 This authentic Thailand stir-fried dish is made by frying pork into a red chili base that includes fresh lemongrass, galangal, coriander root, kaffir lime, garlic and shallots. It's one of our most popular one-dish meals, known as Pad Ped Moo, and it's simply bursting with a rich, herbaceous, and almost medicinal flavor. 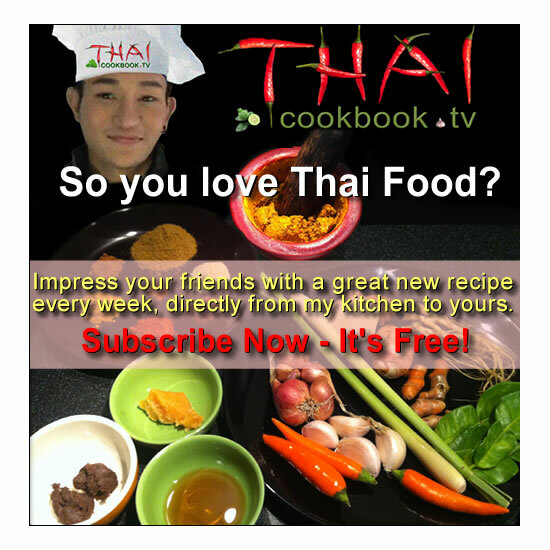 In this version we add a healthy portion of bamboo shoots, some carrot, and green chili. It makes a nice main dish when served on a small plate to be shared, but it is most often eaten just like this with some fresh, hot rice. What's in our Sliced Pork with Bamboo Shoots in Red Chili Sauce. 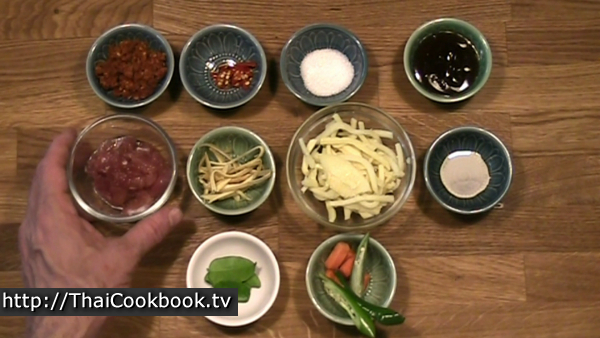 How we make our Sliced Pork with Bamboo Shoots in Red Chili Sauce. 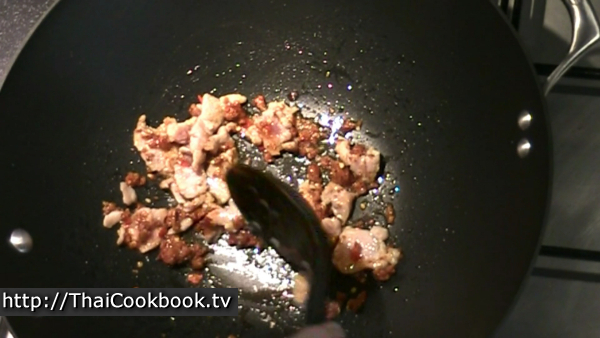 1) Fry the sliced pork in a small amount of oil until cooked. 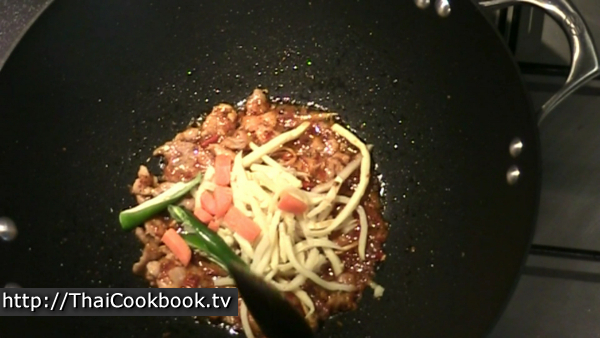 2) Add the red chili paste and hot chili and fry together with the pork. Add a little water to make a sauce. 3) Stir in the finger root, bamboo, green chili, and carrot. Cook until hot. 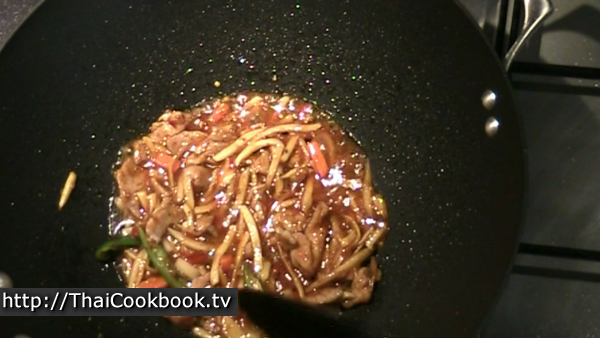 4) Add the sugar and soy sauce, stir-fry until melted. 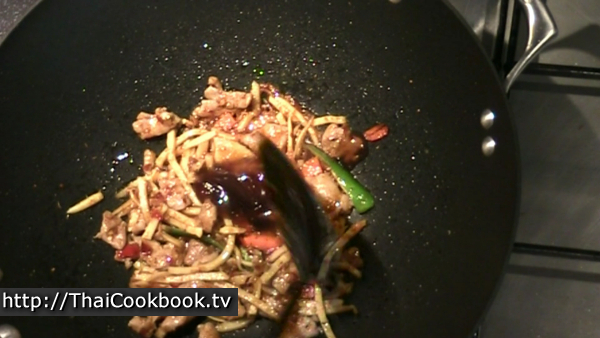 5) Add the oyster sauce and enough water to make the sauce again. Add the kaffir lime leaf, remove from heat, and serve. Slice the pork into very thin slices. If using canned bamboo, rince and drain well. Cut the Krachai (finger root, Chinese key herb) into very thin strips. Cut a few pieces of carrot and some mild green chili. Tear one kaffir lime leaf into 2 or 3 pieces. Chop 1 or 2 Thai hot chilies, depending on your taste. Measure the chili paste, sugar, and soy sauce. Organize everything well before you start to fry. 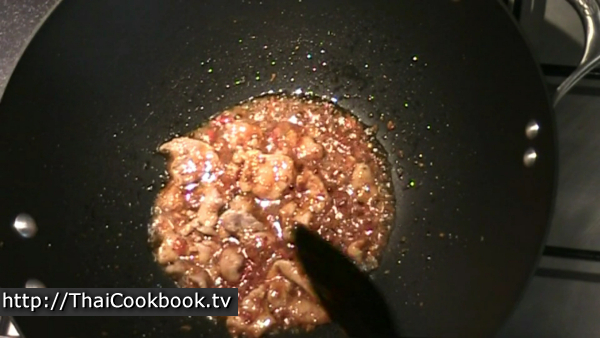 Heat 1 tablespoon of oil in a wok or frying pan. 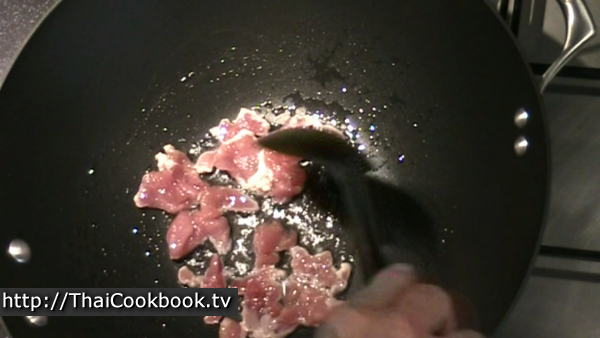 Add the sliced pork and fry it, stir continuously until it is nearly cooked all the way. Stir in the chili paste and hot chili and fry together until smooth and dry. Add a small amount of water to thin down the chili and make a light sauce. Continue cooking until hot again. Add the finger root and stir in well. Add the bamboo, carrot, and green chili. 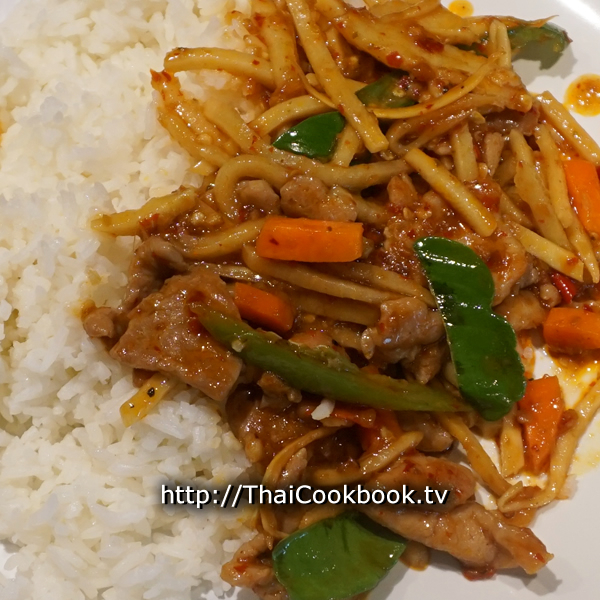 Stir in well and fry for a few seconds. Add the sugar and soy sauce and stir in, frying until the sugar melts. Add the oyster sauce and stir in well. Fry until smooth. 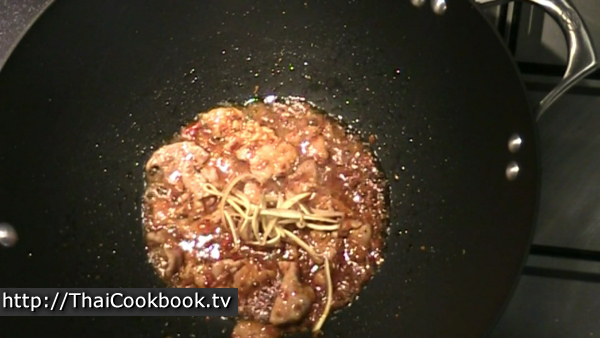 Add just enough water to loosen up the ingredients and make a small amount of sauce. 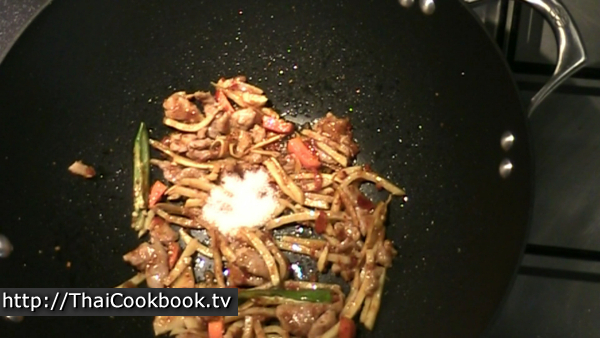 Stir well and let it get very hot, then stir int the kaffir lime leaf and remove from the heat. 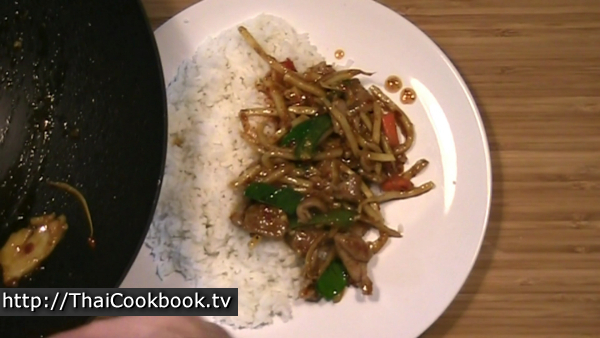 Serve immediately with steamed rice for a delicious one-dish meal.